After enjoying breakfast at your hotel, if Herend is on your wish list, head over to József Nádor tér 11, just a few blocks from the Pest side of the Chain Bridge, near the heart of the high end Andrássy utca shopping street. Here, you'll find the Herend shop, offering Hungary's finest porcelain since 1827. Queen Victoria chose a pattern for her own table during the Paris exhibition in 1896. Continue one block south to Váci u. As you make your way down this popular shopping street, you'll happen upon shops offering the wares of Hungary's other top porcelain companies, Hollohaza and Zsolnay in addition to a large selection of galleries and handicraft shops. If you need refreshing, stop by the century-old Central Kávéház. This restaurant has been home to Hungarian literati since the early 1900s. It has been renovated to replicate its original design and is a luscious setting for a choice of numerous pastries as well as a full menu. Follow Váci u. to its southern end and discover small shops offering designer jewelry, unusual Hungarian clothing designs, and one of a kind crafts. At the end of Váci u. you will find the Great Market Hall. While the main floor of the gargantuan glass and iron hall is crowded with shoppers admiring choices from the vast array of fresh and colorful produce, spicy sausages, salamis and bright red peppers, the mezzanine level is more sedate. Merchants peddle souvenirs such as embroidered tablecloths, colorful peasant clothes, T-shirts, and leather goods. Do not hesitate to bargain for a better price. Another main attraction is the often crowded food stands, providing perhaps the best taste of regional customs, both cultural and culinary. Groups of garrulous locals convene for an afternoon beer and a generous helping of steaming sausages and sauerkraut. Delve into deep bowls of goulash heavily spiced with paprika or choose a copious portion of stuffed cabbage complete with sizzling sautéed potatoes. A meal here with a small glass of beer is roughly 1,500 Ft ($8.50) per head. For a real culinary culture experience, try a lángos, Hungarian fried dough with shredded cheese, and garlic juice for 800 Ft ($4.50). Although you have to eat standing at a tall table, lunch here should not be missed. In the afternoon, to walk off a bit of your lunch, add some sightseeing to your shopping day. 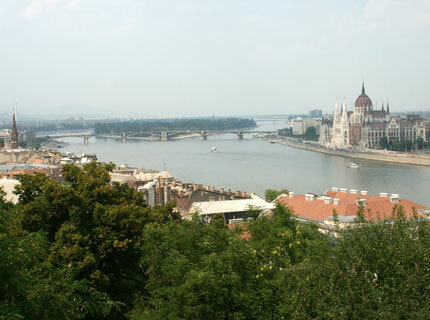 There are numerous worthwhile sites in Pest, but we recommend spending the afternoon visiting the Dohány Synagogue and St. Stephen's Basilica, two religious treasures. The Dohány Synagogue is the second largest Jewish synagogue in the world, after Emmanuel in New York City. Upon entering, you'll immediately be surprised to notice that the space strongly resembles a Catholic Church, because the original architects were not Jewish and were basing their designs on their own past experiences. Admission includes an informative one-hour guided tour offered in English, including visits to the temple, the memorial garden and its famous Weeping Willow Memorial, plus the attached Jewish Museum. If you are looking for some trendy hip clothing designs, turn left out of the synagogue and continue to Látomás at Dohány utca 20 where you will find a consortium of collections by young Hungarian designers. Turning back in the direction of the synagogue, take a 15-minute walk to St. Stephen's Basilica, which dominates much of Pest's skyline. The beautiful edifice combines Classical, Renaissance and Baroque styles because it was completed in distinct stages from 1845-1905. On your way, sneak into the Károly körút passage way to savor one of a dozen flavors of hot chocolate or special coffees at Aztek Chocolat or indulge in one of their sinfully delicious chocolate truffles. Wine lovers are in luck; within easy walking distance of St. Stephen's is an excellent wine shop, Boutique des Vins. The shop is run by a former sommelier and is located at József Attila u. 12. When you find number 12, you'll see a large Jaguar dealership. Walk around the dealership to find the small wine shop on the side. A nice selection of Hungarian wines is on offer, as well as friendly and informative service. Ask for an explanation of the vintages and number system of the sweet, amber-hued Tokaji wines that is indigenous to Hungary. The remainder of your second day should be devoted to relaxation and pleasure. Spend the late afternoon at the Széchenyi Thermal spa and baths, one of Europe's largest, located in City Park. Take a swim in the lap pool, or just soak your travel weary body in one of the thermal pools with Lida and the swans looking over your shoulder. Each thermal spas has a different heat setting and is mineral-rich for therapeutic relaxation. A full suite of massages and treatments are also available. As you enter the building, consult the English-language "menu" of options located on the wall. If you are feeling energized, walk through City Park to Heroes Square, the most celebrated square in the city. There you will find the statues of fourteen of the greatest leaders of Hungary starting with King St. Stephan on the far left. All seven on the left side were Hungarian kings. On the right side, only Matthias Corvinus was a king, while the others were Hungarian heroes. To the left of the square is the Fine Arts Museum and to the right is the Art Exhibition Hall. After travel, shopping, and sightseeing on your second day in the city, you'll want to finish the evening with a casual dinner. For a traditional restaurant with an extensive country-style menu of Hungarian specialties, look no further than Paprika Etterem at Dózsa György u. 72. This country hunting lodge-style restaurant has bountiful portions of Hungarian favorites including goose and wild boar. For those who like choices, head over to Liszt Ferenc tér or Ráday u. Each has over a dozen restaurants with a variety of cuisines.